The global stem cell banking market is growing at a CAGR of 9.1% during the forecast period reaching USD 10.5 billion by 2024, due to the development of novel technologies of storage, preservation and processing. Stem cell banking is the method of accumulating cord blood, extorting and cryogenically freezing its stem cells for forthcoming use. Cord blood stem cells are used for treating blood diseases such as sickle cell disease, leukemia, and thalassemia. The global stem cell banking market is growing at a significant rate due to the development of novel technologies of storage, preservation and processing. The market has witnessed a high demand for placenta stem cells over the last few years, due to the increasing public awareness regarding the therapeutic prospective of stem cells. 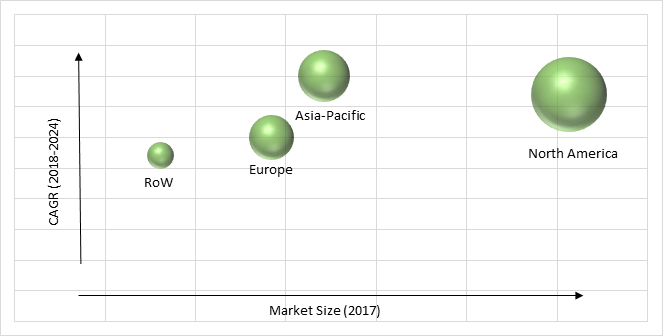 The stem cell banking market is segmented by the source into dental pulp-derived, adipose tissue-derived, bone marrow-derived, placenta, human embryo-derived and other. Of all, placental stem cells account for the major share and are expected to grow at the fastest rate in the global market during the forecast period, due to the increasing number of cord and placenta banks and growing public awareness regarding the therapeutic potential of stem cells. On the basis of service type, the stem cell banking market is segmented into sample analysis, sample preservation and storage, sample processing, and sample collection and transportation. Sample collection and transportation hold the largest share and is expected to grow at the fastest rate in the market due to high penetration of its services, increasing number of stem cell banks in developing countries, increasing stem cell-based research, an increasing number of hematopoietic stem cell transplantations, and growing public awareness about the therapeutic application of stem cells. The stem cell banking market has also been segmented by application into personalized banking application, research application and, clinical application. The personalized banking contributed the largest share in the market due to growing prevalence of blood and immune system-related disorders, advantages of personalized banking over the community and public banking, exceptional pricing of service plans charged by service providers, growing adoption of precision medicine across developed countries, and increasing public concerns regarding the clinical abuse of stored stem cell samples. The growing awareness on the therapeutic potential of stem cells, increasing approval of clinical trials in stem cell research, increase in hematopoietic stem cell transplantation procedures, development of novel technologies for stem cell preservation, storage and processing, and increasing investment in stem cell based research are the primary growth drivers for stem cell banking industry. Initiates are taken by various companies and organizations to broaden awareness regarding stem cells. For instance, in the U.S. CordBloodAwareness.org was formed to increase the awareness about the umbilical cord blood stem cells. Growing global burden of major disease, increasing healthcare expenditure and public awareness related to the therapeutic potential of stem cells are also fueling the growth of the stem cell banking market. Moreover, it has gained immense popularity in emerging economies. The strict regulatory framework and high operational and processing costs are the major challenges for the growth of stem cell banking market. Moreover, the socio-ethical issues involved in stem cell research such as destruction of human embryo and religious briefs are considered as the hindering factor for the market. Geographically, North America is the largest stem cell banking market. Some of the other factors leading to the growth of the North American market are expanding network of stem cell banking services, technological advancement in the field of stem cell preservation and collection technique, availability of federal funding for research, and ongoing approval of stem cell lines for various disease treatments. Moreover, growing number of stem cell transplantation procedure and growing public-private investments for stem cell researches, and increasing public preference for private stem cell banks over public stem cell banks are also driving the growth of the North American stem cell banking market. Asia-Pacific is observed to witness the fastest growth in the market. As the region comprises of largest population and the awareness for stem cell banking is increasing rapidly among them. In addition, increasing awareness on the therapeutic potential of stem cells, improving healthcare infrastructure are also creating a positive impact on the stem cell banking market growth in the region. Key players in the stem cell banking industry are investing in the development of innovative and advance products, which is strengthening their position in the market. In May 2018, Cordlife launched PlumCare DNA Advisor, to detect and manage genetic mutations associated with hereditary conditions in the Philippines. In addition, in December 2017, Cordlife had partnered with Eone-Diagnomics Genome Center (EDGC), a certified laboratory in South Korea, to offer non-invasive prenatal testing in Indonesia and the Philippines. Cord Blood Registry Systems, Cordlife Group Limited, Cryo-Cell International, Cryo-Save AG, LifeCell International, StemCyte, ViaCord, Global Cord Blood, Smart Cells International, Vita34, and CryoHoldco are some of the key players offering products.